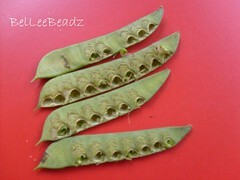 My husband took a photo of these pods that had fallen off a tree in our garden. Neat holes where the seeds used to be have been carved out by birds that feed on this. He found it quite amazing that the holes were so uniformly dug out.